The Fairphone, which was meant to be an easily repairable, long lasting smartphone, will no longer be supported. Fairphone, the company behind the device, will no longer sell replacement parts and has halted software development. 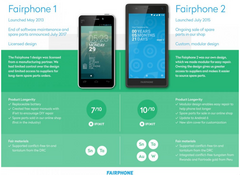 When it debuted in May of 2013, the original Fairphone was an ambitious device. It didn’t have the latest specifications and didn’t run the latest and greatest of Android, but its approach to the smartphone industry was a unique one at the time (and even more unique today): the original Fairphone consisted of easily replaceable, fairly-source parts that made for quick, simple, and guilt-free repair. While the phone never caught on with the masses, a diehard community sprouted up around the device and its company (also named Fairphone). Sadly, Fairphone announced the end of this dream on Friday. As of last week, Fairphone will no longer support the software or hardware of the original Fairphone 1. In a letter from CEO Bas van Abel, the company stated that most of the individual components used for repairs were no longer manufactured by their partners or were no longer financially viable to pursue. The letter tells of the difficult history the company had in securing an economically feasible partnership with electronics manufacturers around the world, but it seems that the components that were used in the original Fairphone are now too old to manufacture on the smaller scale needed by the company. In an arguably more surprising move, Fairphone also announced that they would stop pursuing software development for the Fairphone 1. This means that current Fairphone users will be stuck on Android 4.4 KitKat, which is almost 4 years old at this point. The original Fairphone may also be left open to malicious attacks as security patches developed for Android over the past 4 years will never reach the device. Toward the end of the letter, Abel urged customers to consider upgrading to the Fairphone 2, which was released in 2015. The letter stated that Fairphone would work to “generate more working capital” in order to purchase more spare parts for the Fairphone 2 upfront so they could avoid the same supply chain problems. The company is hoping to tweak more modern components to fit the Fairphone 2 in order to extend the life of the device, which is currently powered by the 3-year-old Snapdragon 801 SoC. Software support does seem active (though lagging) for the Fairphone 2 at this time; the phone was recently updated to Android Marshmallow. Time will tell if Fairphone is able to stay afloat and continue long-term support of what is now its only device. Fairphone customers and supporters are understandably upset, and the comments section of the letter is rife with complaints and accusations of mismanagement. Subjectively, it is sad to see a company that was focused on reducing smartphone waste and the fighting against the rampant consumerist mindset in the industry fail to meet their goal. The Fairphone 1 is now essentially dead and destined for landfills; the smartphone that was originally designed to reduce electronics waste will now be adding to it very soon.